Following an impressive summer collection from Ted Baker I awaited the Flannels show at Manchester Fashion Week. Flannels stock over 150 luxury designer brands including Dolce & Gabanna, Gucci & Prada. They source key pieces from the hottest collections and also offer a range of footwear and accessories. My favourite pieces on the catwalk were from Temperley London. I'm a big fan of Alice Temperley's classic, feminine designs and can see why Kate & Pippa Middleton often favour her gorgeous gowns for public engagements. Temperley London's Spring/Summer '12 'Grace' collection featured flowing gowns, draped fabric and luxurious prints. Models wore elegant white silk headscarves, accessorised with big sunglasses and sported bright red lips in keeping with the glamorous theme. My favourite piece which also made the audience sit up in their seats was the flowing white beaded detail dress with off the shoulder floaty sleeves. 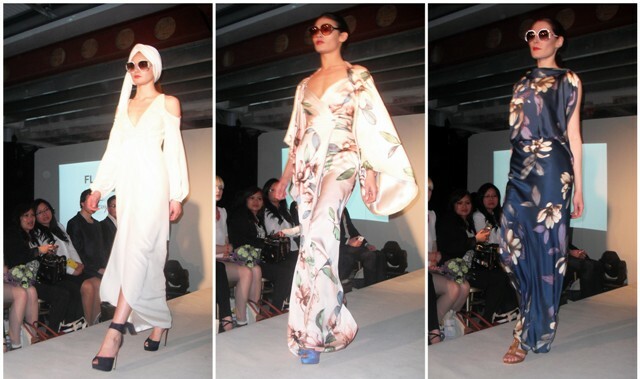 The floral print jumpsuit looked elegant draped with a kimono wrap and paired with blue satin peep toes. The navy floor length silk gown featured a magnolia print and had a dipped back design. As the show came to a close anti-fur protesters that had been unknowingly sat waiting in the audience and demonstrating outside the venue earlier took to the catwalk with a banner and threw leaflets into the crowd. As far as I'm aware there was no fur on the catwalk during the Flannels show.. but what would a fashion week be without a bit of added drama! You have to have a bit of drama! Loving the floral patterns.